Cohousing communities are intentional communities, created and run by their residents. Each household has a self-contained, private home as well as shared community space. Residents come together to manage their community, share activities, and regularly eat together. Cohousing is a way of resolving the isolation many people experience today, recreating the neighbourly support of the past. This can happen anywhere, in your street or starting a new community using empty homes or building new. Cohousing communities can be inter-generational, welcoming anyone of any age and any family structure, or specifically to cater for people who are older or are communities of common interest, for example for women or LGBT groups. The initial group contribute significantly to the design of the cohousing community and take an active role in creating the community. Most cohousing communities have a common house, with shared facilities such as cooking and dining spaces, meeting and playing areas, laundries and guest rooms. This may mean that the private dwellings are smaller as residents also have the benefit of the common facilities. Shared outside space for gardens, childrens’ play, parties and food growing often feature in a cohousing project. The size and scale of cohousing is appropriate to support community dynamics for easy informal communal contact; this is usually between 10-40 households. Where possible, design is used to encourage social interaction, for example by keeping cars to the periphery and putting a common house in centre of the site. Many communities eat together regularly, and so the common house is designed with large dining facilities. Residents manage their own community, looking after the maintenance and development of it, running the finances, tending the gardens, organising shared activities. The community is governed in a non hierarchical way, often using consensus decision making. All adult residents are encouraged to take part in decision making; some communities also require residents to undertake a set number of hours work for the community. Cohousing communities actively encourage open membership. People wishing to join a group will need to work out if cohousing is right for them. 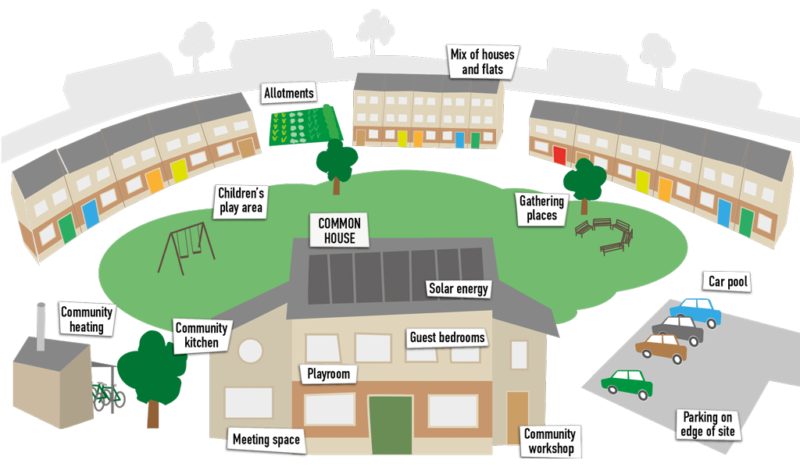 Cohousing groups often host wider community activities in the shared space and common house.